It’s been a day to remember for those who want to save libraries. Campaigners in Brent have today received legal permission to have a judicial review in the High Court in just a couple of weeks’ time. This, if the funding for the case is found by the campaigners, will be the first into court and will set the vital precedent. Also today, a court in Birmingham has agreed that there can be a judicial review on the Gloucestershire closures in September. As well as these two, and also today, campaigners in the Isle of Wight have been told they will receive funding to go to court and there apply for a judicial review. However, Mr Ed Vaizey, sometimes known as Evaizey, the responsible minister, appears to be using the local legal challenges as an excuse not to be responsible. In a letter to Gloucestershire campaigners, the DCMS said “When Ed Vaizey described the current situation as ‘fluid’ in his recent speech he was referring to the fact that s [sic] authorities are completing consultations, changing their plans in light of consultation responses or, like Gloucestershire County Council, subject to Judicial Review proceedings. Until these are concluded the situation in many authorities is unsettled.”. Campaigners, understandably angry that their legal action originally caused by the minister’s inaction is being used for further inaction, may be forgiven if they start thinking that there will be no ministerial intervention until the libraries in question are either (a) demolished or (b) airlifted to South Korea to help with their library building programme. 395 libraries (319 buildings and 76 mobiles) currently under threat or closed/left council control since 1/4/11 out of c.4612 in the UK (for the complete list by area see the page “Tally by local authority”). Librarian professional body CILIP forecasts 600 libraries under threat (inc. 20% of English libraries). The Public Libraries News figure is obtained from counting up all reports about public libraries in the media each day. Anti-multiculturalism gone mad or a rational policy shift? – Voices for the Library. John Dolan reviews the Newham mayor’s decision to remove foreign-language newspapers from libraries to encourage learning of English. Multiculturalism in Newham may be here, going or gone. Even so delivering to local black and minority ethnic communities a replica of their written and spoken culture need no longer be a public library priority; here the library draws people to a mainstream economic purpose in a library that’s a policy vehicle and political resource. Report of the Inquiry into overcoming the barriers to literacy – Information Twist. Looks at library-related areas of the report – of which there are many, all strongly in favour of public and school libraries. “The active encouragement of reading for pleasure should be a core part of every child’s curriculum entitlement because extensive reading and exposure to a wide range of texts make a huge contribution to students’ educational achievement. This is why libraries are so important to the development of a reading culture – both those in schools and those in the community.”. Full report here. Cornwall – Considering sharing funding of libraries with “health organisations and the private sector”, although council denies this would be privatisation. Suffolk – Options for control of libraries are (a) in-house council business unit, (b) external company “owned by the council” or (c) “an independent company which is contracted by the council”. 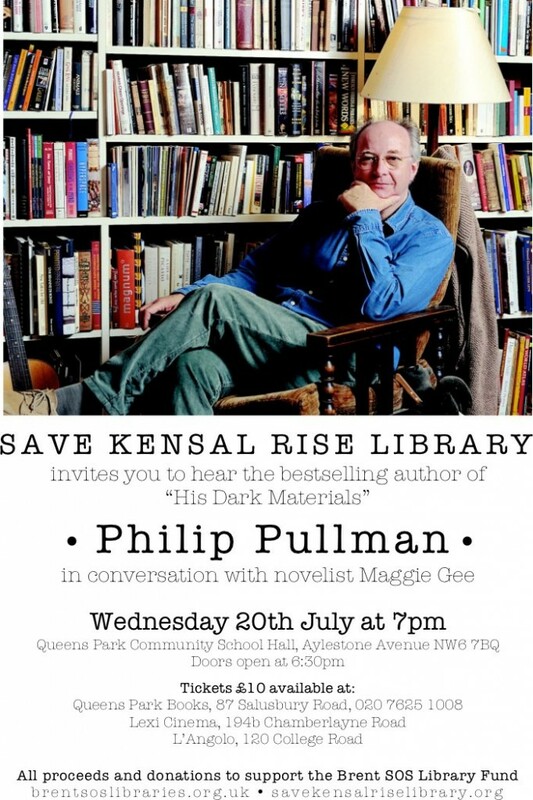 Brent – Philip Pullman joins fight to save Brent libraries threatened with closure – Alan Gibbons. “Authors Zadie Smith and Alan Bennett have already given fund-raising events for the campaign. 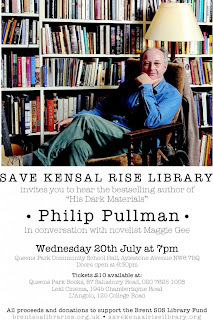 Now Philip Pullman, one of the UK’s most celebrated and controversial writers, will be speaking to an even bigger audience in Kensal Rise on 20 July.” Event is part of fundraising needed for landmark legal case. Gloucestershire – Judicial review for Gloucestershire library service – BBC. Council cannot close libraries until review has taken place, probably by the end of September. Isle of Wight – Legal aid funding granted to campaign to save Wight’s libraries – Friends of Isle of Wight Libraries (press release). Case will be funded on grounds that cuts breach the “comprehensive and efficient” requirement of the 1964 Act and also that an equalities impact assessment was not done (see quote below also). Leigh Day solicitors say “We have advised our client that she has a good case and expect the Court to grant permission for a full judicial review.”. Also in New attempt to half Island library closures – IWCP. “We have also discovered that the IWC is trying to get Equality Impact Assessments done for the five areas who’s libraries are under threat. As part of this there will be forms available in the five libraries for the users to fill in- we need as many people as possible who actually use the libraries at Bembridge, Brighstone, East Cowes, Niton and Shanklin to go in, ask for the forms and fill them in- they are expecting a low response- please show them that Islanders really care about ALL of our 11 libraries and give them a huge response.” Isle of Wight – Friends press release. Leicestershire – Libraries and museums to cut opening hours to save money – This is Leicestershire. “By closing libraries, museums and the record office at their least busy times, we can cut costs and keep them open at the most popular times,” said Coun Sprason.”. See also Plan to slash library hours across Hinckley and Bosworth – Hinckley Times. Somerset – Library campaigners “optimistic” – Somerset County Gazette. “Watchet library user Rebecca Hird is taking legal action against Somerset County Council’s move to close 11 libraries in October, unless volunteers step forward to run them.”. However, Porlock group will volunteer to work in otherwise closing library and is likely to charge for use. Suffolk – Dear Latitude Performers – Rosehill Readers. Campaigners ask for support from performers at Latitude Festival. Suffolk – Libraries to stay open under new council plans – BBC. Three options for library service all involve increased privatisation. “We’re done some preliminary financial modelling and, based on the expressions of interest that have come forward, we believe we can make significant savings and also increase the income for the library service.”. Also All libraries set to stay open – EADT. Warwickshire – Interview with UNISON and Councillor about library cuts – BBC Radio Coventry and Warwickshire. Wokingham – Libraries are safe, says council boss – Get Wokingham. “We are looking to find a experienced organisation, commercial or other to continue provide all statutory services.”. Print article This entry was posted by Ian Anstice on July 7, 2011 at 10:07 pm, and is filed under Uncategorized. Follow any responses to this post through RSS 2.0. You can skip to the end and leave a response. Pinging is currently not allowed.